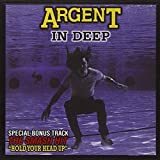 After the commercial success of their ATN album (mostly though the Hold Your Head Up single), Argent had to confirm with the fourth and I have suspected for decades that the album's title was probably referring to their situation with regards as to their record company's expectations. Rest assured that if Rod Argent had done most of the work up to now, this album was to be Ballard's moment. Indeed, In Deep (you just knew you'd get that one thrown in your face, didn't ya? ;-) was a much more sensible album especially regarding their (limited) prog credentials and their slow maturity. Graced with an artwork that leaves little doubt as to how deep, this album is the group nearing its apex. Starting out on another huge hit (this time written by Ballard), God Gave RnR To You is everything you'd expect from its title: pure commercialism and aimed at the charts. Not only was the opening salvo overtly obvious, but Ballard follows it up with the two-part It's Only Money, giving us a splendid and unashamed message. Only the side 1 closer Losing Hold is really pointing to a deeper meaning, with its darker ambiance, but remaining little more than a ballad. The flipside does resemble a bit this predecessor in that Be Glad only has the organ/piano middle section to raise your eyebrows (but ultimately fail to keep them raised as he's obviously trying to be a would-be Emerson), while the Christmas tune is clearly another shameless call to Mercury (the god of commerce ;-). Upon this bleak outlook, only one sunray on this deep pool of cess they're dipping their toes in: Candle On The River! This track is probably their better studio track with lyrics expressing thoughts on over-population, great Hammond and guitar works over a great and inspired rhythm. Obviously this overtly commercial album is their best-remembered, but if you're a demanding proghead, I'd not call it anywhere close to essential in your prog collection. While it has its share of pleasant moments (even in the commercial bits), I'd rather aim the casual discoverer to their next album. Argent struck gold with the first track on this album, "God gave rock'n'roll to you". Their previous hit single, "Hold your head up" had substantially raised their profile, but this time they came up with a song which captured the musical essences of the period perfectly. The pop rock band Slade had been enjoying a run of hits with sing-a-along anthems, and "God gave rock'n'roll to you" would have made the ideal Slade single. As a result it sold in enormous quantities, and made Argent a headline act. The song was more recently resurrected as a huge hit once again, this time for Kiss. 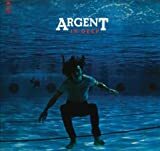 In some ways, it was unfortunate that "In deep" was the album which the masses went for, since it is a good album but by no means Argent's best. "It's only money" maintains the more commercial feel in two pretty much unrelated parts. The best track is actually "Losing hold", a darker and heavier cry for help, with some excellent vocals and a great instrumental ending. The second side of the album is poor, pointing the way Argent were to go following the departure of Russ Ballard. There are better (and admittedly much worse) Argent albums than this, but it does have its moments. 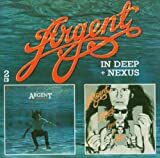 Argent were a second division Prog band who never quite managed to break through to the major league, though during the year-or-so period 1972-73 they threatened to do so with 3 charting singles and a couple of strong albums. This is the second of those 2 albums - All Together Now being the first from 1972 - which was originally released in 1973. This album has always been a favourite of mine, but listening to it again now after all these years I think I can understand why they didn't achieve wider acceptance: they were a band of 2 halves. One half is bluesy rock-n-rolling - sounding not unlike early Uriah Heep maybe - led by Ballard's lead guitar playing with fairly minimal input from Rod Argent, examples being the 3 main Ballard written tracks here - the successful single God Gave Rock And Roll To You, and the 2 parts of It's Only Money with their lovely riffing (a fourth track - Rosie - is a bit of an indulgence). The other half is steeped in classic melodic Prog, led and dominated by the various keyboards of Rod Argent - full of Hammonds and pianos, and an odd Tron too - complete with time and key changes: Losing Hold is a big ballad; Be Glad is a nice little rocker which goes off at a tangent for an extended Hammond and piano led instrumental central piece; Christmas For The Free is a simple ode to peace-and-goodwill sung by Rod Argent and is the song I am most likely to fast-forward over; Candles On The River is the Prog masterpiece here with some lovely extended Hammond and guitar soloing over riffs pushed along by bass and drums. This last track particularly is alike to BJH with a bluesier singer! My CD re-issue has, as a bonus track, probably their best song Hold Your Head Up (actually taken from their previous album) which still stands up today as a Prog classic, another Hammond-fest with understated, yet hypnotic, riffs followed by those classic powerchords on guitar and organ. Wonderful stuff! This album is very much of it's time - few overdubs, and a very straightforward production with just the 4 members playing along together more-or-less as they did live (that's how it sounds to me anyway!). At around the same time in 1973 Pink Floyd were moving the goal-posts as far as sound quality and recording methods were concerned, but this is relatively rough and raw, and all the better for it. The sound on my copy could be seriously improved with a re-mastering program. Packaging is OK I guess - no lyrics, but there are liner notes giving a short band history in addition to track credits. Overall, I re-iterate that this is a personal favourite, and I have long thought the band, and especially Rod Argent, are not given enough credit. Heartily recommended to lovers of early 70s Prog but perhaps not quite a classic. The band signed a smash hit on their previous album (Hold On Your Head Up") and pursued in that direction with "God Gave Rock & Roll To You". But even if commercially successful, this studio version never really convinced me. I far much prefer the heavy rock "It's Only Money" (part one) with its infectious beat and great organ break. This is how I like the band the most. Heavy and effective rock. But part two though doesn't provide the same feeling at all, unfortunately. Some sort of loose psychedelic and chaotic trip. "Be Glad" has a more complex structure and is more related with prog. Rod is delivering a very good keys piano break in the middle part: first on the piano, which sounds almost classical. A harder organ attack is following and the whole is combined just before the upbeat and bluesy finale. My fave track so far. After the melancholic and avoidable "Christmas For Free", the more serious "Candles On The River" brings us back the heavier riffs. Hypnotic, psychedelic with a tint of blues: this is another highlight from this album. The best part is again the middle organ one. I really like these sounds which can be compared to the contemporary Hensley's ones. It is just a pity that the album closes on a blunder: "Rosie" is really pitiful. The good news is that the CD version holds a great bonus track. The long version of "Hold Your Head Up" is always a pleasure to listen to. It is a great moment of rock music indeed. It is my favourite song from the band ever. Another good "Argent" album. On the edge of the heavy prog genre. Three stars. 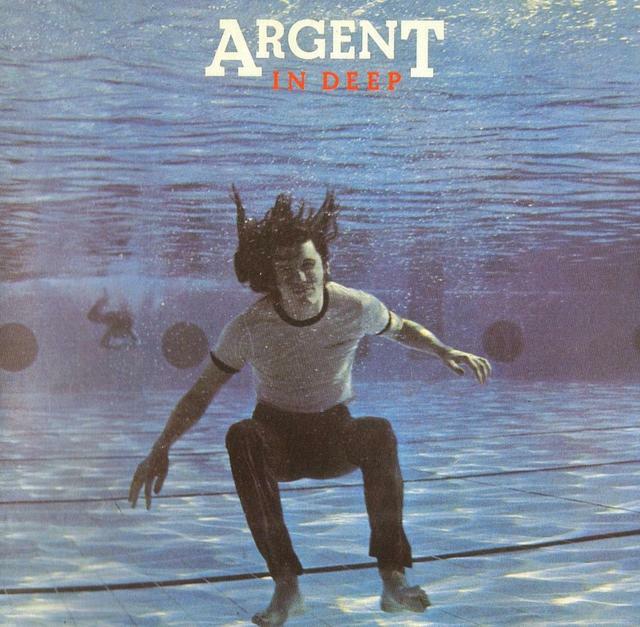 Post a review of ARGENT "In Deep"